The biggest “issue” started several years ago when Dad decided to replace the wiring harness. He began by removing the old one. He has been trying for six years now to reconnect everything. The car starts, usually, and it runs. The head lights work. The fuel gauge, the trafficators, and lots of other things do not. That’s why he wanted me to follow him from one place to the other. My mother was happy to ride along. As we stood in the garage moving all the pieces of wire, tools, nuts, bolts, bulbs, gauges, and other things I couldn’t identify from the floor of the driver’s seat into a bag for safe keeping, he mentioned that he’d taken the oil filter off and couldn’t get one of the nuts back on the bolt that holds the lid on tight. My fingers were not long enough to perform the task either. As he put the nut in the glove box, he said he wasn’t concerned. I wondered if I should be. Next came starting the car. Dad had already determined that it wouldn’t start by just turning the key and pulling the starter knob so I moved my car forward as far as it would go with the hope of stretching my jumper cables from battery to battery. That’s when Dad mentioned that British batteries in cars back in the 30’s were reverse polarity. When I asked what that meant, he said he wasn’t sure how to hook up the charger, positive to positive and negative to negative, or the other way around. So then I asked what would happen if he did it wrong. “Oh, it’ll arc a bit” was his reply. Again, he wasn’t concerned. I remember rolling my eyes and wondering what would happen next. I eased my car close to the MG and there was no way the jumper cables would stretch from the front of my car to his rear seat. We decided to back my car up and see if we could push the MG forward diagonally with the hope of getting the batteries closer together. Consider that my sister’s car was parked beside mine in the driveway limiting the distance forward we could push the car. Compound that with Dad’s recent hip replacement and my recent broken foot, and we weren’t working at the top of our game. Additionally, the MG weighs a lot for a small car and has no power steering. I think we moved it about two inches before we gave up on that idea. The battery charger in my sister’s garage provided our next option. We should have started there. I plugged it into the extension cord. Dad hooked up the connectors (without concern for polarity for some reason), and we waited. 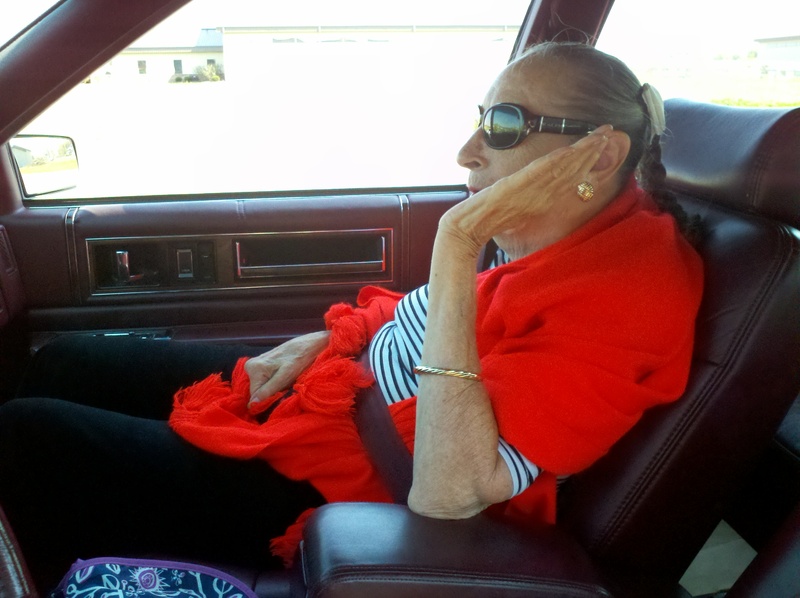 During all of this, my mother is sitting in my 1993 Cadillac. Now she’s usually happy to be out for a day’s ride. Today she was not so sure. She’s been married to my father for sixty years and she knows how these things often go. Today’s drive would be definitely be another unforgettable adventure in her memory bank. Dad folded his long lean body into the driver’s seat. He’s not as limber as he used to be. He had a hip replacement last December and there are just moves I don’t believe he should be making. He settled in, turned the key, and on the second try, it started. After he drove the car out of the garage, I noticed a large puddle of oil on the floor and a trail of oil following the car. Remember that nut we couldn’t attach. Dad stopped in the driveway to wait for me. After putting down the door and watching him ease out the driveway, I discovered another large puddle and another trail. I silently prayed there was enough oil in the car to make it to our destination. We were on our way. 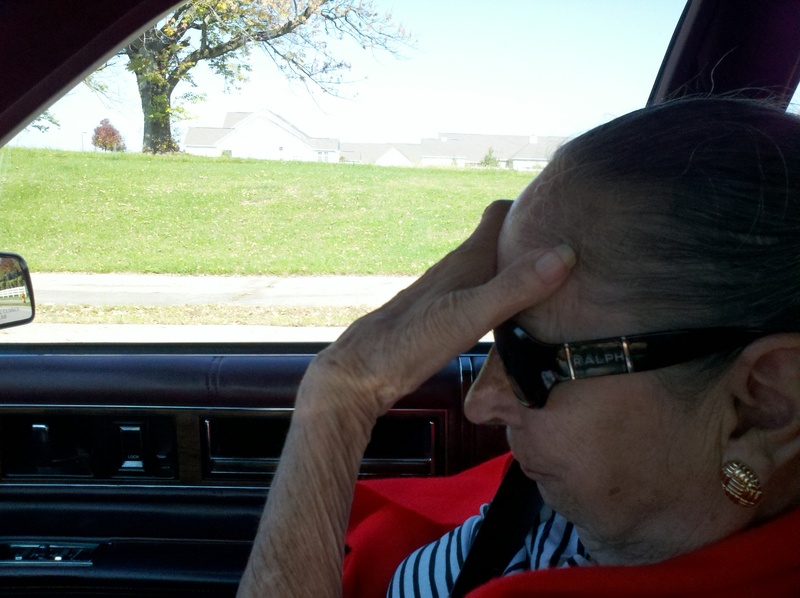 Mom and I hadn’t gotten far when I realized that the brake lights on the MG were not working. I needed to give Dad a little more distance. We were cruising along heading toward our destination. Everything seemed to be going quite well when Dad started slowing down on a long straight road. There were no lights ahead or stop signs. Just past an intersection he pulled over on a section of road where the grass sloped sharply away from the road. Because he was so close to the intersection, I pulled in front of car, barely off the road. Dad climbed out of the car and informed me that he had run out of gas. Oh my. Of course I didn’t have a can of gas in my truck. Surprisingly, neither did he. With no spare fuel available, we considered towing him. I had a long length of half-inch rope in my truck. We threaded it from my hitch through his bumper back to my hitch and through his bumper again. What we lacked in strength, we hoped to make up with multiple lengths. Just as we were finishing, a local policeman stopped and inquired about our situation. I casually commented that Dad was out of gas and asked directions to the nearest filling station. The cop shared that the nearest source was straight ahead, just over the bridge on the right. I was grateful it was close by. Glancing in my rear view mirror and seeing no traffic approaching from behind, I eased onto the roadway and began pulling the old MG. I quickly discovered that it was indeed a heavy car. And I knew the brakes were not the best. With lots of luck on our side, we passed through three green traffic lights, up and down the overpass all while maintaining our distance apart. We pulled into the gas station without incident. 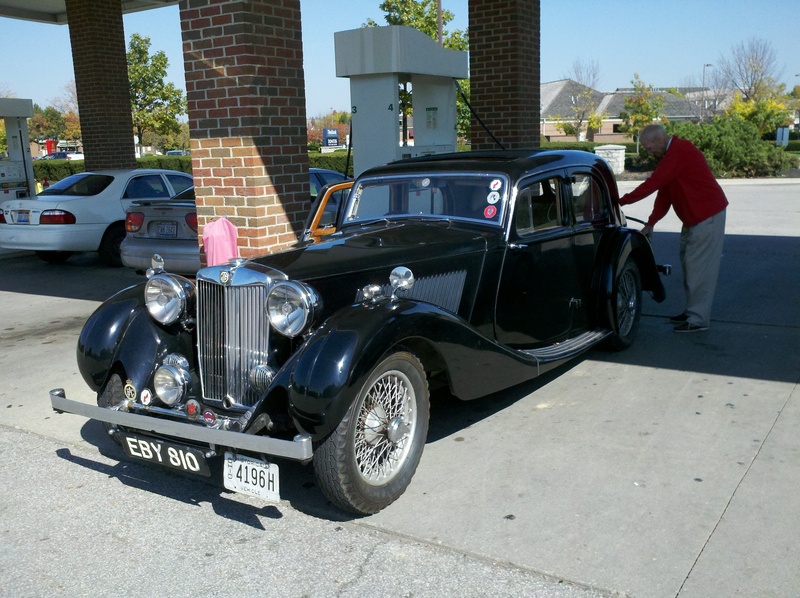 I slowly eased past the pumps watching closely to see when the MG was lined up with the nozzle. As I got out of the car with the expectation of untieing the tow line, a black SUV was quickly approaching the gap between the two cars. I had visions of all three cars being pulled together and my bumper being pulled off my car. here was a quick jerk as he came in contact with the rope. He never slowed down. 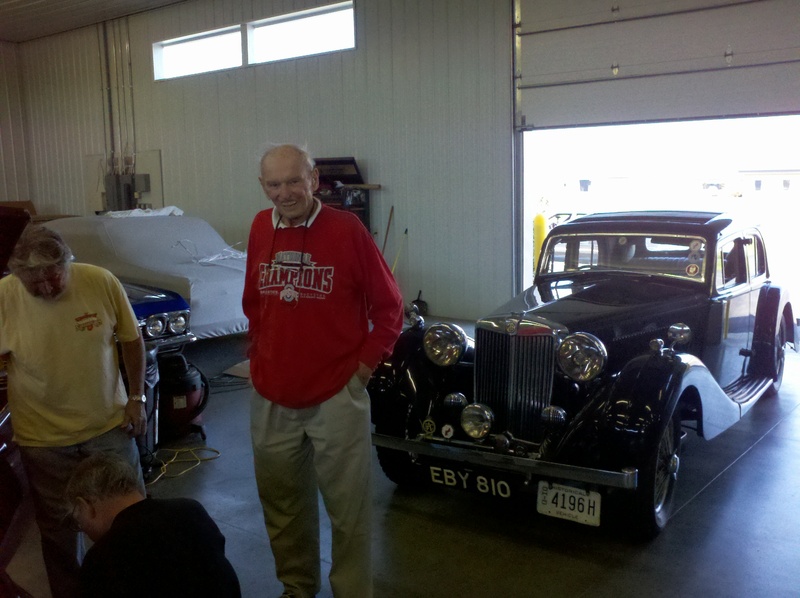 I looked at the MG and its bumper was intact. So was mine. Unbelievably, the rope had broken into four pieces as the SUV sped between the cars. At that moment I was really glad I had used small rope instead of a huge thick tow line. After Dad filled the car with gasoline, we prepared to head once again toward our destination. He climbed into the driver’s seat and turned the key. The fuel pumps were pumping, pumping, pumping. Pulling the starter knob did nothing. Great. We discussed hooking up the jumper cables and then discussed pushing the car with the hope of Dad jump-starting it. That seemed like the easier alternative since we still didn’t know how to hook up the jumper cables. There was a tall young man walking out of the service station store. I called over to him and asked if he’d mine helping me push. I wanted to believe that it was hard for a fit, young man to ignore assisting a middle-aged women who needed help pushing a car. He came over and we started to shove the car. Almost immediately there was a third set of hands assisting. On the first two attempts we did not push fast enough for anything to happen. As I started the third attempt, I feared running out of parking lot. This time Dad released the clutch and the MG started. 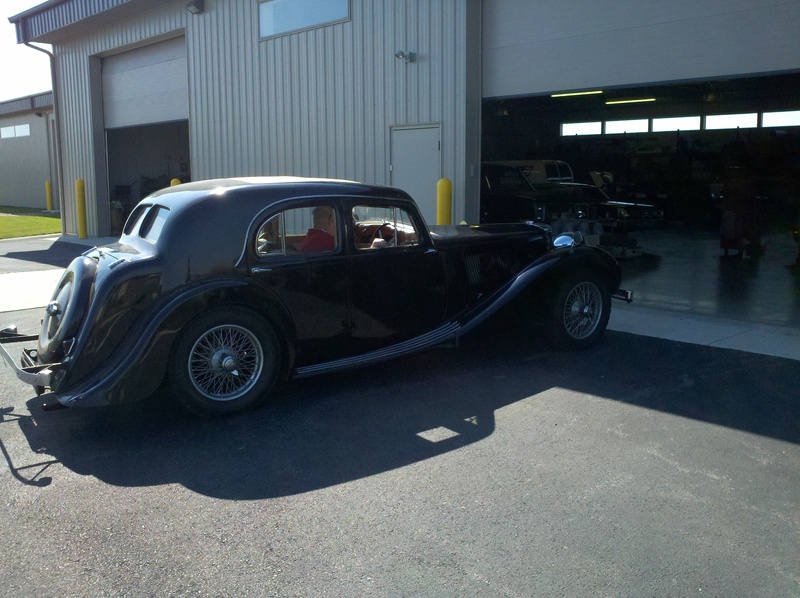 I thanked my assistants and headed for my car while Dad muscled the black beast through a 180 degree turn. Soon we were again back on the road. The next part of our journey involved several left turns and some roundabouts. This is where Mom spent a lot of time with her head buried in her hands. Dad pulled out of the gas station without incident. After a quick right, we needed to make a left turn at the next light. 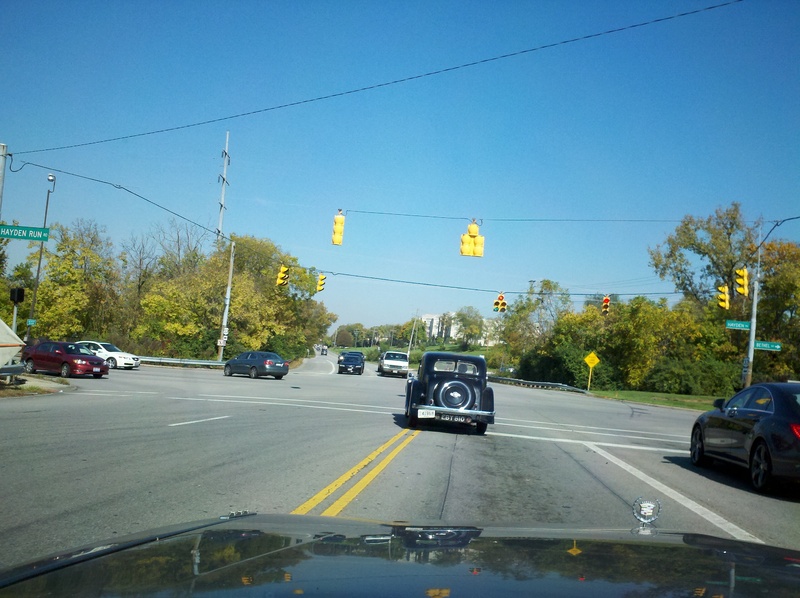 He was working his way through the gears heading up hill toward a left turn arrow. Before he got to the intersection, the light turned yellow and then red. I winced as he turned left in front of three lanes of stopped cars. The man is like a cat with nine lives. We waited for traffic to clear before making the left turn ourselves and catching up with him. Ahead there was a car waiting to turn left. Dad veered sharply off the right side of the road around several deep potholes before returning safely back onto the roadway. 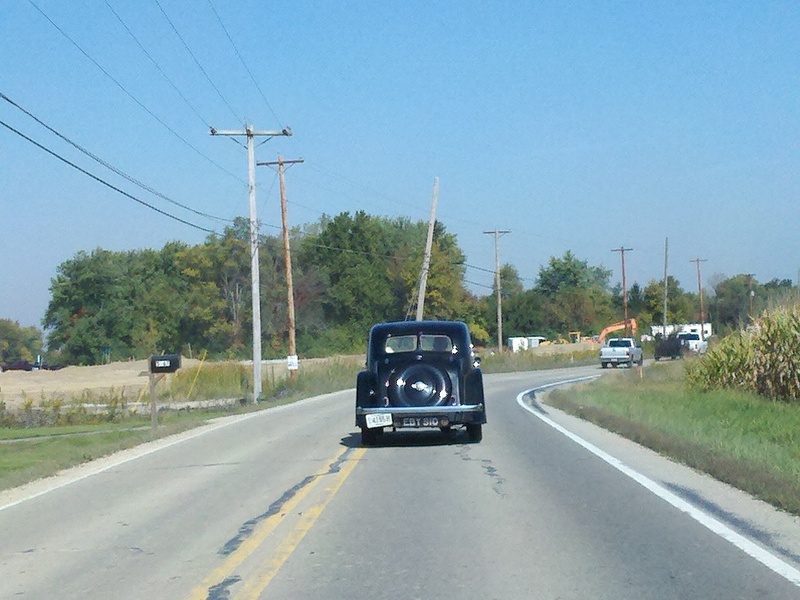 I think he was struggling with the lack of power steering during that maneuver. Mom’s hand went up over her eyes again. We made it through the roundabouts and passed road construction without incident. Dad drove through only one stop sign before arriving at our destination. What a ride. He climbed out to ask the warehouse owner where to park the car. After sharing some of our trials along the way, Dad commented that in the old days trips always included a challenge or two. According to him, that’s what made them fun. I’m not sure Mom would agree. Still, she’s never left his side during their sixty years together. It was another unforgettable adventure for everyone’s memory bank.